At this point, chances are pretty good that this is not "goodbye" for Tony and Jeanne. The only real stumbling block to their romance is her pesky husband David – a man who by all accounts is a decent guy who offered sincere friendship to Tony, despite his knowledge of their past love affair. NCIS Season 13 Episode 16 provided an almost throw-away case of the week involving stolen guns. Two Navy patrols caught up with the thieves as they were in the process of loading up their stolen munitions. Then, after the shootout was done, one petty officer was dead, and the other was hurt. One of the three thieves was hurt but managed to get away, and one other was shot dead. Turns out the ATF had an ongoing investigation into stolen guns. They had purposely allowed guns to be stolen so they could follow the tracking devices embedded in the firearms to find out where they were going. Once Gibbs got the full story, they tracked down the final thief and arrested him. But there were two real stories that overshadowed the case, one involving Gibbs and Dr. Taft, and the other involving...Tony and Jeanne. We sensed the beginning of the true drama when Tony and Gibbs had their face-off in the bullpen, with Tony having to finally grudgingly give in to contacting Jeanne again. The reason was to get her (and her husband's) help in finding the doctor in the South Sudan who operated on one of the thieves. The tension in that scene was terrific. Tony's admission to Jeanne that he too had that "not feeling whole" thing going on pretty much broadcast the idea that there was still a lot of heat between them. The fact that she so vehemently denied it and insisted that this was "goodbye" just seemed to ratchet the romantic tension between them even higher. If we were putting money down on this, the bet would be that they're going to sail off into the sunset together. And Mr. Jeanne will be left hanging out to dry. Excuse me, I meant to say Dr. Woods. That's the guy I feel for. He's not a wife-beater, nor is he a mean or vindictive guy. Even Tony says the man is practically a saint (though not in so many words). David Woods knows the score too, as evidenced by his blunt admission to Tony that both of them seem to be eyeing each other. A case could be made that Tony's "not feeling whole" deal has to do with the way he processed his split with Ziva. Maybe that's who he needs back in his life. Or maybe it's just hunger pangs. Maybe some kung pao chicken would do the trick. If this does turn out the way it seems to be going, and Tony and Jeanne are going to be a couple, then this is not a whole lot different than Bishop's disappointing split with Jake. Only in this scenario, David's the injured party and Jeanne (and Tony) are the miscreants. Ugh. The other story was almost as compelling. Gibbs is still talking with Dr. Taft, but more as friends than as doctor-patient therapy participants. It was a treat to see Gibbs stumble so badly when Taft's wife showed up. That gaffe crumbled his irritated walls of defense, especially when she admitted that Gibbs was actually helping Taft a great deal. Never dreamed that the woman at the bar was Dr. Grace Confalone, the therapist Taft was trying to get Gibbs to see. I was certain it just a woman with whom Gibbs was about to get romantic. He figured out who she really was faster than I did. So cool to see that Gibbs and Taft have a real and true friendship. The urgency with which Gibbs arrived at the hospital after the car bomb; the way Gibbs encouraged Taft to take that long trip with his wife, and earlier when Gibbs told Taft to play hooky...all that spoke of a close friendship between the two. After so many years, it's important for Gibbs to finally have someone he can count on as a friend. And now it looks as though he has a therapist too. Although it'll be hard to see if she can get him to open up and talk. Chances are she'll at least have more success than Taft. She seems to be very quick and able to push Gibbs off his game. It's doubtful she'll take any guff from him either. I'm not sure why someone felt the need to set off a car bomb on Dr. Taft. Seems kind of pointless, at least when it comes to the case of the week. Disappointing to see Gibbs admit to not really caring about the awkward exchange between Tony and Jeanne. Par for the course, obviously, but disappointing just the same. This case had the potential to become a mini-season arc, involving illegal gun sales and perhaps even terrorism. Too bad it was just devised as a vehicle to get Tony and Jeanne back together. 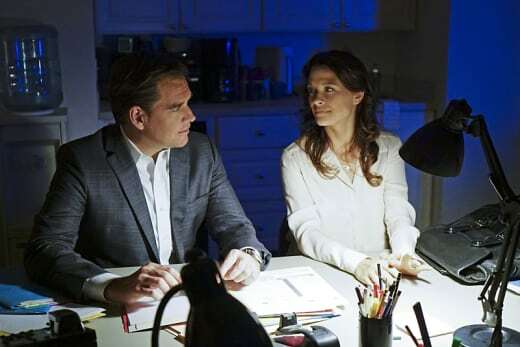 Be sure to tune in next week when we review NCIS Season 13 Episode 17, entitled "After Hours." Note: Delilah's back! As always, make sure you stay up to date with the current season. You can do this right here at TV Fanatic when you watch NCIS online. What are your thoughts on this episode? What's going on with Tony? What's your take on Gibbs and Taft? Let us know in the comments below! Dare you to pick that up, Missy. Permalink: Dare you to pick that up, Missy. Tony: I know that feeling. The not feeling whole part. Tony: And If I had one wish, Jeanne. Tony: I would turn back the clock to right when we got back from South Sudan. Cause I think that was a much better ending for both of us. What? Jeanne: I guess I would go back further. Good night, Tony. 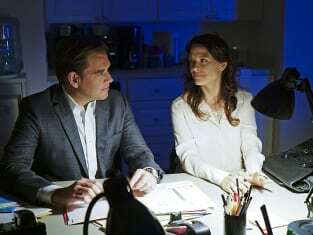 NCIS Round Table: Is Tony Rekindling an Old Flame?